Once again, Children at Risk has been offered the opportunity to earn funds by taking the Santa Photos at Westgate Shopping Centre this Christmas Season! 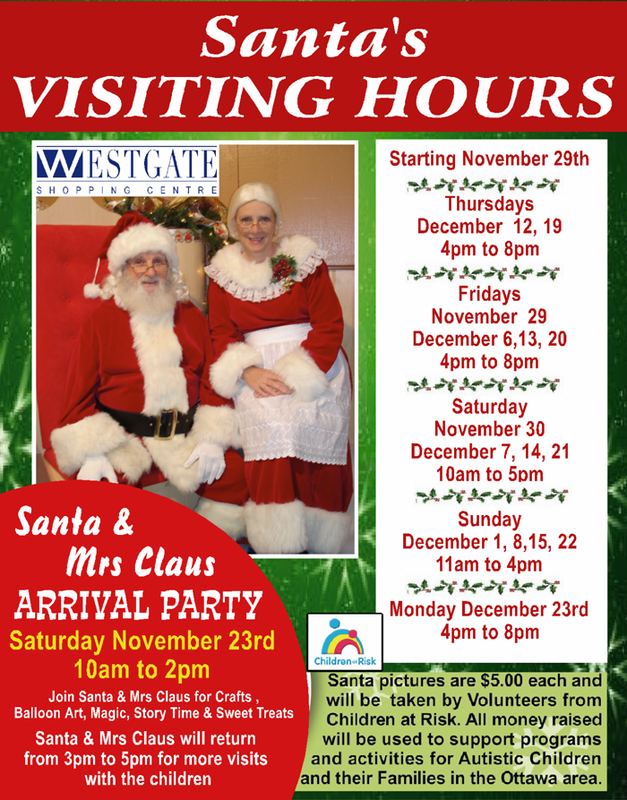 Santa arrives ON Saturday, November 23 – 10 AM to 5 PM! This year again we are covering the entire holiday photo schedule - from November 23 to December 23. For the 1st 2 weeks, photos are only being offered for Friday evenings plus Saturdays & Sundays. Then it will be Thursday and Friday evenings, Saturday and Sunday the 2 weeks before Christmas. We will need volunteers throughout the schedule - more on Saturdays due to the volume - see below for the needs. We will be using a digital camera and printing the photos on-site with a colour printer. Cost for a Santa photo will be $5 with ALL of the proceeds being donated to Children at Risk! Please look at the schedule below and let us know if you can help out - even a couple of hours at a time would be great! We will need both volunteers who are comfortable (and somewhat good!) at taking photos, as well as table workers to take cash/print the pictures (easy to learn). This would also be an opportunity for a teen and parent to work together to get volunteer hours!